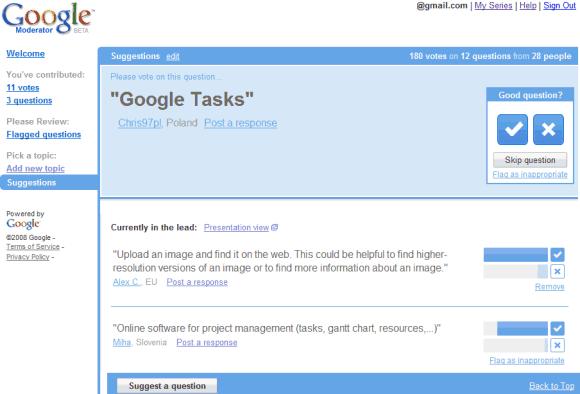 Google Moderator is a small application initially created for submitting and voting on the questions for Google's tech talks. "At Google, we host a large number of "tech talks". These talks cover a wide rage of Computer Science topics like research in machine learning and methods for ranking images based on text queries. I've enjoyed attending these tech talks, but as the number of attendees has grown over time, the question-and-answer part of the talks hasn't been able to scale," explains Taliver Heath. The application turned out to be useful for other things, like the company's meetings, and Google decided to launch it publicly on the App Engine platform. I created a list of suggestions for Google's services and anyone can add new suggestions or vote on the existing ideas. The most popular ideas are displayed at the top, but Google Moderator also lists random suggestions to make them more visible. I just read about Google Moderate somewhere else but couldn't understand the basic idea behind building such application but your post has elaborated it a lot. Thanks a bunch. Don't miss the featured series, especially "Ask a Google engineer". "Online software for project management (tasks, gantt chart, resources,...)"
"separate management of contacts, not in gmail page, ex. contacts.google.com and sharing of contacts between different google accounts"
"Ability to migrate several google/google apps accounts to one"
"Upload an image and find it on the web. This could be helpful to find higher-resolution versions of an image or to find more information about an image." "SMS notifications for Gmail. This could be implemented as a new action for filters." "Be generous and open, and enable integration between Google Talk and Skype, Yahoo Messenger and MSN (in order of likelihood)." "Make text in a pictures searchable, by using OCR." "Release new version of Google Talk with video and GrandCentral integration." "Google Local TV Listings with personalization, recommendations and Google Alerts integration." "Create a Google Maps/Google Contacts mashup that shows all your contacts on a map, with status presences." I’m the creator of TownHall (http://www.town-hall.net) which offers similar functionality to Google Moderator but with secure controlled access for internal business/enterprise use. It is still under development but I’m looking feedback to help make it a great product. Please visit and try it out! Being built and running on Google AppEngine, I think it would be great if the Google Moderator source code would be available as an example app. Rietveld is a good example, but any additional resources will help newbies get quicker up to speed. Make Google Contacts within Google Apps completely vcard compliant, plus compatible and auto-syncable with Plaxo, LinkedIn, Facebook, MobileMe, iPhone, Blackberry, Google Android, Windows Mobile Outlook and Exchange Server address books. Also, allow contacts to be attached to Google Apps Mail being sent (as a vcard attachment). Really it makes it easy to gather and prioritize questions or opinions.